Bowen High School, the oldest school in the South Chicago area, has a deep tradition of academic excellence. It was originally established in 1889, serving elementary school children with only four rooms allocated for high school students. Rebuilt in 1910, and experiencing enormous growth in the 1930s necessitating the additions of a new gymnasium and 30 more classrooms, Bowen School developed into South Chicago High School. From 1993–2011, it served as host of four small schools. 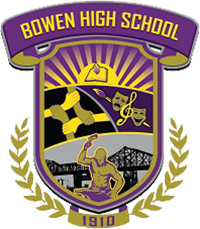 In September 2011, the small schools were re-consolidated back into a single, general curriculum high school and became today’s Bowen High School. All Bowen students and families will obtain an excellent education, compete globally, and affect positive change in their community. Today, our rigorous curriculum challenges our students. Bowen students are anxiously engaged in the arts, athletics, enrichment classes, JROTC, special education, and more. They work together with our dedicated staff and our supportive community, forming a symbiotic relationship where all mutually benefit. Our students graduate high school with the desire to continue on to post-secondary education, becoming successful citizens with successful careers. Period 1 - 8:00 a.m.–8:50 a.m.
Period 2 - 8:54 a.m.–9:44 a.m.
Period 3 - 9:48 a.m.–10:38 a.m.
Period 4 - 10:42 a.m.–11:32 a.m.
Period 5 - 11:36 a.m.–12:26 p.m.
Period 6 - 12:30 p.m.–1:20 p.m.
Period 7 - 1:24 p.m.–2:14 p.m.
Period 8 - 2:18 p.m.–3:08 p.m.